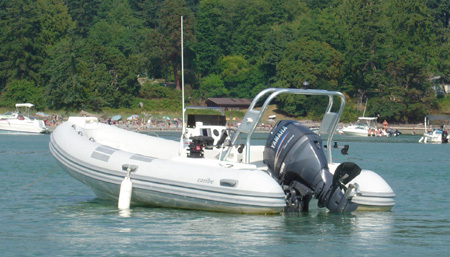 Inflatable boats with rigid hulls are called RIBs (rigid inflatable boat)or RHIBs (rigid hull inflatable boat). These boats just ooze "adventure" I think. Look at some of the new models with marketing like "The Ultimate Adventure Boat". The hull on rigid inflatable boats is made of fiberglass, aluminum, or plastic (some small boats). This rigid hull gives these boats a smoother ride and better handling in choppy water. An inflatable tube with an external coating of PVC, Polyurethane or Hypalon is attached to the hull. This tube is what makes ribs so incredibly safe, and improves the handling in rough water. Aluminum is more durable if you plan to beach the boat a lot. Sand and pebble beaches can wear away at fiberglass bottoms more quickly. Aluminum hulls can be lighter than fiberglass. An aluminum boat will weigh in at about 75% of the weight of a comparable size fiberglass boat. Fiberglass is a very strong material and more flexible than aluminum. What does that mean? Well, impact with a rock may result in less damage because the fiberglass flexes before it breaks. Fiberglass is more easily repaired than aluminum, so the cost of the repair may be less. Fiberglass also has the advantage that it is formed in a mold so there is no limit to the variety of shapes that can be created with it. Plastic hulls (made of Polyethylene) are found on a few small ribs which are designed for use as tenders. Plastic hulls are incredibly durable and stand up to rough use with little or no maintenance. 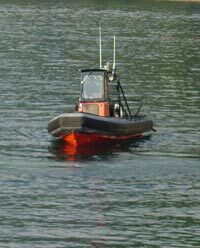 The inflatable tube on a rigid inflatable boat is either glued on or uses some type of mechanical attachment system. The actual process of creating a strong glue bond to the hull is quite extensive and requires careful control of temperature and humidity. It can take up to 8 hours to properly glue a tube or collar to a rib. Something that the high quality brands will take the time and care to do. Finally what features do you want in your boat? There are more features and more options available for ribs than available for other inflatable types. It is even possible to get full cabins. RIBs are increasing in popularity in North America. They are the ultimate rugged seakindly adventure boat.